One can only marvel at the speed at which nominations for high positions are approved in Hungary. 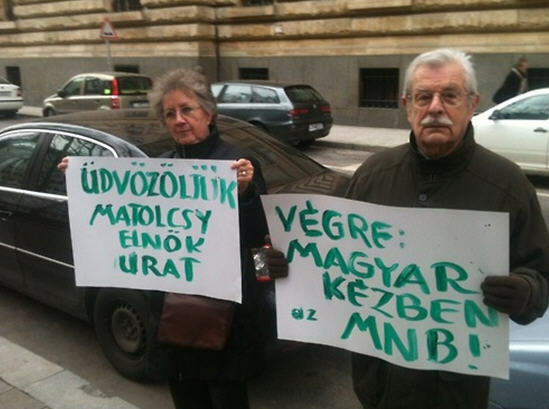 Early this morning we learned that the inevitable had happened: György Matolcsy was nominated to be the new chairman of the Hungarian National Bank, with his post as head of the Ministry of National Economy to be filled by Mihály Varga. Two or three hours later we heard that the parliamentary committee had found both candidates to be outstanding. On Monday, I’m sure, the House will confirm them and members of the government parties will stand and rhythmically applaud the excellent job Matolcsy did in ensuring Hungary’s “economic success” in the last three years. Although the final result was never in question, there was some heat during Matolcsy’s confirmation hearing. Even outside of the chamber the MSZP spokesman called Matolcsy a “ridiculous public figure”; inside, members of the opposition questioned Matolcsy’s suitability for the post. Fidesz members of the committee welcomed Matolcsy’s assurance that he plans to pursue a conservative monetary policy. He emphasized his determination to keep inflation in check and promised to stop the spread of bank loans in foreign currencies. On the other hand, Tibor Kovács (MSZP) envisaged a bumpy road for the new chairman because of his reputation. His appointment holds not so hidden dangers for Hungary’s financial stability, he added. Gábor Scheiring (PM = Párbeszéd Magyarországért) also had a few harsh words to say about the appointment of the least successful member of the cabinet to be head of the central bank. MSZP, Jobbik, and independent members voted against him but naturally it didn’t matter. During the hearing Matolcsy talked a lot about the sins of his predecessor, András Simor. According to him, the Hungarian National Bank didn’t fare well under his six-year stewardship; Matolcsy promised a bright future for the bank over the next six years. Well, we know how much Matolcsy’s predictions and promises are worth. Otherwise, he tried to calm nerves as much as possible and gave the impression of a man who knows his job. The trouble is that Matolcsy really doesn’t have any banking experience. But he sounded, at least on the surface, knowledgeable and responsible with a couple of incomprehensible sentences. He promised to achieve price and financial stability while supporting the government’s economic policies. He added that he will safeguard the independence of the Hungarian National Bank, something a lot of people doubt at the moment, both in Hungary and abroad. Matolcsy’s nomination and confirmation hearing didn’t roil the currency market. As almost every commentator pointed out, the markets had already priced in Matolcsy’s appointment. But even if the forint didn’t budge, credit default swaps (CDS) did rise. During the month of February they fluctuated between 290 and 305; today they moved up to 310. Not a steep rise but perhaps significant nonetheless. In any case, according to domestic and foreign commentators Matolcsy will be cautious for a while, testing the water before he makes any significant changes in the bank’s policies. But then he will probably stir things up. For example, in the past he talked about the desirability of weakening the Hungarian currency. Peter Attard Montalto of Nomura is convinced, as are most economists and opposition politicians, that the Hungarian National Bank will cease to be an independent institution. Montalto is also certain that Matolcsy will make decisions that may not be beneficial to the Hungarian economy but will further the political goals of Fidesz. We don’t know yet what will happen to the two vice chairmen. Will they be fired or left in place for the sake of appearance? The two current vice chairmen always voted with the chairman, but since the appointment of five extra members of the monetary council they were consistently in the minority. In the past Viktor Orbán insisted on appointing a third vice chairman, but that plan was thwarted by András Simor and the European Central Bank. Now it seems that a third vice chairman will be appointed after all. Matolcsy handpicked his favorite man from his ministry, Ádám Balog, assistant undersecretary in charge of taxation. Balog was instantly replaced by another government official. So, the appointment of a third vice chairman has been in the works for some time. Some people jokingly call Matolcsy’s economic theories “esoteric” in the sense that few people understand them. Matolcsy wrote several books that presumably offer some inkling of his thought processes. In the near future I will try to summarize what I can find on the subject. One of his “discoveries” is that “success is sometimes invisible, sometimes incomprehensible, unusual, or at times painful.” Here are few of his ideas: Only people matter and not governments, companies, or financial institutions. What matters is what people believe in, what moves them and how they behave. So, what is important is whether success and accomplishment are associated with us. These are just a few of Matolcsy’s ideas that one can only hope he will not carry with him to the Hungarian National Bank.